Thank you Angus and team for showing us your spotless workshop and giving insight to the work you offer. It was a good opportunity to meet great people and great cars. Thanks. You also did quite well on the weather! What a great plan for initiating such a group. A shame some some have nothing more positive to share. Whilst some are willing to add time and effort to better things, would others not so inclined just refrain from bashing in this thread especially and the forum in general. Today I read 7640 km of the Autobahn have a speed limit, 18150 km do not. Surely feels the other way around, here in southern Germany. you might want to reconsider having your address public. You can edit your post, and give the address as a private message if the need arises. Now that went faster than I had expected for #2 and #3. Welcome to the forum Patrick! Nice to see a new member from near Stuttgart :) What car have you aquired - any pic‘s? 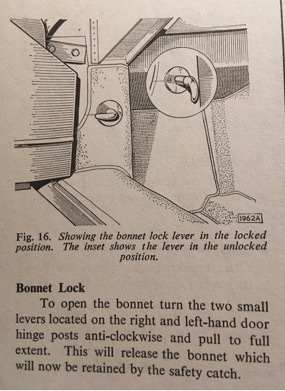 Topic: bonnet handle right position ? Re: bonnet handle right position ? David, may I ask - what is OSD? Tell us how much you are asking?